While fly fishing on the iconic streams and tailwaters throughout the Colorado Rocky Mountains is an experience no one should deny themselves, there are also many great places to enjoy fly fishing on ponds and lakes. 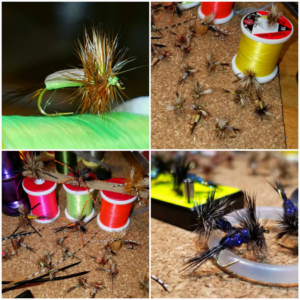 Our Stillwater Fly Tying Class at The Blue Quill Angler is hosted by Peter Hill who instructs attendees on how to effectively tie flies that are successful on stillwater like lakes and ponds. The fly patterns presented in this class are the staples of our own fly boxes for lakes throughout Colorado. In this intermediate Stillwater Fly Tying Class, you’ll learn patterns including chironomids, callibaetis, damsels, crustaceans, and terrestrials. What Can You Expect from the Stillwater Fly Tying Class at The Blue Quill Angler? Enrollment in our Stillwater Fly Tying Class at The Blue Quill Angler includes the equipment and materials you’ll need to complete the class including the vice, fly tying tools, hooks, and materials. If you have your own tools and material that you’d like to bring, please do. This class is only $125 per person which includes five sessions that run for two hours each. Classes are held on Tuesday evenings from 5:30 to 7:30, and each enrollee will receive a 15% discount on all the in-stock fly tying materials, tools, and books you may need to take your fly tying game to the next level. Classes are limited to four students, so pre-registration is necessary. This is an intermediate class geared towards those who are familiar with tying their own flies and would like to expand their skills to flies for lakes and ponds. It’s easy to enroll right here online, or give us a call if you have any questions. We look forward to sharing our knowledge with you at The Blue Quill Angler. Pre-registration is necessary. Limited to 4 students. In this class, you will learn a range of fly tying techniques necessary to tie dry flies. We will focus on dry fly proportions, applying deer hair wings, tying in parachute posts, and the proper application of hackle by tying several tried and true dry fly patterns. This class is one evening session taking place on February 22nd from 6:00-9:00 P.M. at The Blue Quill Angler in Evergreen, Colorado. PLEASE READ THIS CAREFULLY: THIS IS AN ADVANCED TYING CLASS; YOU ARE REQUIRED TO HAVE BASIC FLY TYING SKILLS TO ATTEND THIS CLASS. Our goal is to provide you with the skills and techniques necessary to succeed in tying intricate dry flies. Students will leave the class with the ability to tie dry flies with confidence. We will provide the vice, fly tying tools, hooks, and materials, but you are welcome to bring your own equipment if you choose to. If you occasionally wear glasses or corrective lenses, you may want to bring them since these dry flies can be quite small. This comprehensive dry fly class is one night only and costs $50.00 What’s more, each attendee can enjoy a 15% discount throughout our entire selection of fly tying materials, tools, and hooks. The class will cover 4-6 dry fly patterns (dependent on time) that are highly productive for Western fly fishing. This class is scheduled for February 22nd from 6:00 p.m. – 9:00 p.m. and is one night only. We look forward to seeing you in our Advanced Dry Fly class at The Blue Quill Angler in Evergreen, Colorado. Classes are limited to 6 students, so pre-registration is necessary. Please call the shop to claim your spot in the class. The Cost of The Class is: $125 and students receive 15% off of fly tying materials up to one week after the course. You may also purchase a gift card for the value of the class if you are interested in purchasing the class as a gift for friends or family.